Technology innovations and Google has been running alongside for many years now. Google has been pioneering development of web platform since its existence. Still to say Google has contributed a lot to the web and hope it continues to do so. The cloud based storage space is just seeing a lot of activity. Just yesterday Microsoft launched SkyDrive for Windows. And now Google, today launched Google Drive. Google Drive is a cloud based storage service that allows seamless access to your files from your multiple computers. It doesn’t end here; with Google drive you can take your file sharing and storage experience to a whole new level. Google’s document service called as Google Docs will now be having built in support for Google Drive. You can work with others in real time on documents, spreadsheets and presentations. Plus it has API for apps. This can allows developers to integrate this service into their apps. Using GDrive you can access your stuff from anywhere. It has your files on Web, your PC, office and mobile. Google says it will be coming up with Android and iOS app that will make GDrive accessible on mobile as well. GDrive app for Mac and Windows is already out and can be downloaded. Google and search cannot be separated. And why should it be, Google makes searching on web easy as you like. On Google Drive, it provides Search by keyword and filter by file type, owner and more. Drive can even recognize text in scanned documents using Optical Character Recognition (OCR) technology. Adding as a bonus GDrive also has a image recognition, you can search images using keywords as well. The most important differentiator that most people are not mentioning is the seamless integration with other web-based applications. GDrive is fully integrated with its other Google Services. You can attach photos from Drive to posts in Google+, and soon you’ll be able to attach stuff from Drive directly to emails in Gmail. You can get started with 5GB of storage for free—You can choose to upgrade to 25GB for $2.49/month, 100GB for $4.99/month or even 1TB for $49.99/month. When you upgrade to a paid account, your Gmail account storage will also expand to 25GB. You can access Google Drive using your Gmail Id. As soon as you login it displays you all the files which have been already stored on Google Docs. It has the link to download GDrive for PC. The user interface is pretty much same as Gmail. The dashboard provides some quick options upfront on the left hand side such as create Documents, Presentation, Spreadsheets and much more. The desktop app is clean and fluid. It synchronizes a folder from your PC with your account just like Drop Box. It can be accessed through Windows task bar. Context menu shows you amount of free and occupied space on your GDrive account. Try out Google Drive now. Do share your experience if you decide to use it. I can understand that there are very few reasons why this app would be convenient. But as soon as people begin storing personal and private data on third party servers simply for the convenience of access they may very well regret it later. Servers get hacked, people’s data will be exposed… none of this cloud computing storage thing will end well… I do not recommend these services for anything more than file transfers/access that do not involve any personal data whatsoever. @Azhar, please answer to this comment. I have received this query in my email today. cloud, now get DOWNLOADED into the harddrive of the new PC/laptop? file/folder right into the online web app? Please advise, any help would be really appreciated!!!! 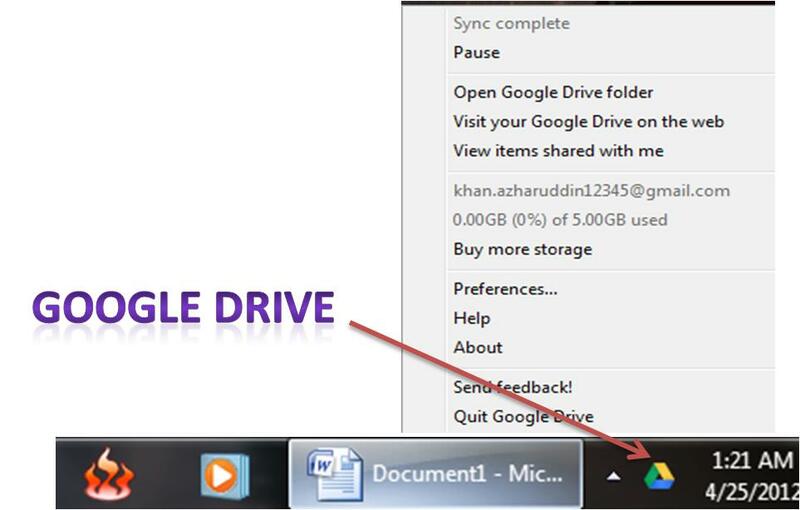 There is a option for “not to sync” with Google Docs, It shows that when you are installing google drive app.. I hope I cleared that, If you have any more questions feel free to comment.